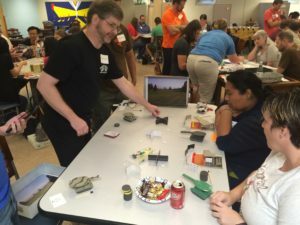 On Saturday, Stonemaier Games hosted its third annual Design Day. We host designers, playtesters, publishers, and gamers from St. Louis and around the country for 13 hours of nonstop gaming. The purpose of Design Day is to bring together designers and playtesters to give and receive feedback on game prototypes, expand their network within the gaming community, and learn from clever mechanisms in published games. If you’d like to know details about how the day is structured, please read this (which very closely resembles what we did this year) and this. I thought about framing this entry as a Kickstarter Lesson. After all, the blog is about crowdfunding, so there are certainly some things to be learned from building community through events. I also thought about talking about events like this from a publisher perspective in terms of ROI (return on investment). But the truth is, running an event isn’t for everyone. It takes a lot of time to organize and execute. It may not be fun for you. And I’m not so sure there is a direct ROI (or, at least, that’s not my motivation for hosting Design Day). Rather, Design Day is just something I like doing. I like doing it for the designers. I like doing it for the playtesters and gamers. And I like doing it for me–it feels good for me to host something fun and useful for others. So I thought it might also be helpful for you to hear a little bit about this year’s Design Day, just in case you’re interested in hosting your own event someday. As playtesters tried out each prototype, they wrote down a 1-10 rating on a little card that would later become their ticket to the game giveaway. Design Day isn’t a competition, but the ratings are meant to help designers figure out how much work their games need. Last year, 3 of the top 5 games went on to become successfully funded on Kickstarter: The End Is Nigh (which is live on Kickstarter now), Biergarten, and the Stockpile expansion. I announced everything in advance. Last year I had the sense that any type of announcement during the day really interrupted the flow of the event. Plus, I realized that anything that needed to be announced could easily be revealed in advance (pending last-minute changes). I used flickering lights instead of yelling. 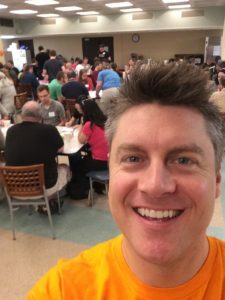 Last year I raised my voice over the din of the room to tell people to wrap up one session or start a new session (Design Day is very structured, with attendees signing up for all sessions in advance). This year I just flickered the lights a few times. It worked beautifully and seamlessly. Small changes to the giveaway. We invite each attendee to bring a good game from their collection that they no longer play. Two sponsors–Middleton Reutlinger (a law firm) and Miniature Market also donated some games this year. In the past, I’ve randomly selected names for the giveaway, which takes a lot of time and results in some people having worse picks than others. So this year I divided the games into two piles on a big table, covered up half the games with bed sheets, and told people they could pick a game at any time from the revealed games…but all picks were final. So you could pick early, but by doing so, you would miss out on a wider selection later. This seemed to work much better than previous methods. Facebook group. About a month ago I created a private Facebook group to help Design Day attendees connect with each other. It wasn’t particularly active leading up to the event, but it’s been very helpful after the event for attendees to find each other online. Better system for no-shows, players wanted, and vacancies. Out of 85 signups, we only had 3 no-shows this year. We also had a few people who needed to leave earlier than expected. For the most part, these were good problems to have, because the event was slightly overbooked. But it caused a little confusion–it’s really hard to tell from looking at the room which tables are full and which need people. So a suggestion was to have a big master schedule on the wall that we can update throughout the day based on no-shows, changes, and open slots. Different location. The location we use (the social hall of a church) works pretty well, and I’m not looking to grow the event (I think 75-80 is the sweet spot for a more close-knit, intimate event), but the room gets quite noisy. So I’m looking into alternatives. Rating system. So far the biggest area we’ve gotten feedback on is the rating system. Designers seem to be looking for more specific feedback than a rating (which they can already get in person and by e-mail), and I need to put the rating scale on the back of the rating cards. That’s easy to fix. Something on Sunday. I think most people (including myself!) are exhausted by the end of such a long, intense day. But I’ve been looking for ways to cater to those–particularly the out-of-towners–who want a little more. The game night I host on Friday night at my condo helps a little bit, and I’d be willing to host something more casual on Sunday afternoon as well (I need a little time in the morning to recover). Have you found value in running or attending gaming-related events? Thanks for linking the campaign for The End is Nigh, Jamey! The feedback we received at the 2015 Design Day was instrumental in making it the game it is today. Humbled to again be within the top 5 designs. It’s great to know that the playtesters thought so highly of Space Gypsies. Looking forward to next year; the Stonemaier Design Day is a great event. So fortunate to have it (and Stonemaier) here in St. Louis! I’ve facilitated board gaming at non-gaming conferences (specifically Autscape) before, if that counts as running a gaming event. Always a fun experience to do, whatever winds up being played and whether I wind up playing myself or if numbers make it more practical for me to purely facilitate, with good scheduling usually resulting in about 5% of the attendees of the conference participating which makes it worth my while. Stephen: What’s your favorite thing you’ve implemented at Autscape that you’d recommend to other gaming-related events/conferences? Scheduling is everything, especially when running gaming related activities at events that aren’t gaming focused. Anticipate what other scheduled events people who are likely to want to take part will be wanting to attend, and make sure it’s elsewhere in the schedule. This can take a couple of years of trial and error to get right. This also applies to larger gaming events where you’ve got multiple things happening at once – i.e. if you’ve got two board game events and two RPG events, two rooms for events, and two slots for events, it’d be bad scheduling to put the board game events against each other and the RPG events against each other, but it goes more subtle than that and will vary from event to event so you kind of need to keep at it, almost trial and error, until you find something that works (In that case, make sure the board game events are always in room A, and the RPG events are always in room B, to make them easier to find, but again… It goes more subtle). I host a big game weekend at my house every roughly 9 to 12 months. Starts midday Friday and goes to Sunday afternoon, technically nonstop. There’s no theme, just friends, but I always try to make it special: custom swag, contests, big group activities, meals worked out in advance, free games given away from my collection and that others bring. I have up to 20+ people here and it’s great, but exhausting. Definitely worth the effort, some friends I only see for that weekend. Will: That’s awesome! I like that you try to create a special experience for your friends. I can understand the exhaustion–if you’re like me, it comes from a place of satisfaction and joy (but it’s still exhausting!). The overall quality of the prototypes this year was really outstanding too. Every year it seems to get better. Dennis: I agree! Perhaps it helps that there are so many great resources out there now about making games? Fantastic event! I’ve been to two in a row and it is my favorite day of gaming all year! 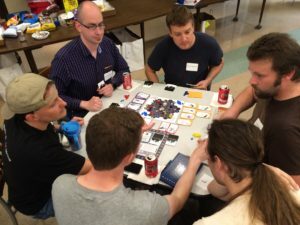 Both Unpub.net and TableTop.Events have excellent game rating systems built into their websites. 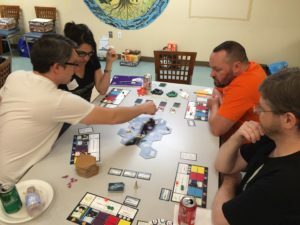 If you are willing to register your event as an Unpub event (which is free) you could have designers and players use the Unpub site, printable feedback form and App to rate games. If you are willing to pay Tabletop.Events a small fee, that site would organize your play sessions for you, allow players to sign up for those sessions, provide a game feedback system, and even print+ship badges for you. I’ve used both Unpub and Tabletop.Events before for the previous three Protospiel and Unpub events I organized. They are fantastic tools that made my life a lot easier, and were a boon to designers. Thanks Jeremy! I very much appreciate the recommendations. They sound quite handy, and I’ll definitely check them out next year. While I haven’t run such an event, I’m well aware of the logistics involved, and simply want to pass along kudos to you for holding this wonderful event for the folks breakibg into the industry. This was my first Design Day and it was great! Lots of really well put together designs. I certainly appreciated the feedback that I got. Regarding feedback, 2 things I noticed at each play test I was involved in: First was that criticism was given in a very constructive and thoughtful manner. Second is how open and receptive the designers were to receiving it. There were a lot of humble people in the room! On a personal note I was a tad disappointed to see that my own prototype didn’t make the top five, until I found out that it was number six! So I am quite happy and excited with that! I think what I’m taking away most from the event is a big dose of confidence to keep moving forward. I hope everyone else feels the same and we see a lot of these games become reality soon. Jamey, I want to commend you on the soul in what you share. It’s straightforward, clear and immensely useful. And generous. I just read your guide to shipping on Kickstarter, in case my experience in other realms didn’t apply. I’ve spent a career manufacturing in India, Mexico and China, I can vouch to all your reader that your recommendations and insights were spot on. Anyway, I just wanted to wish you luck and express my thanks.